SAN JUAN — The U.S. Air Force (USAF) is studying ways to help Caribbean and Latin American countries in their fight against drug trafficking and organized crime by increasing training flights in the region, the service’s senior civilian official said recently. Air Force Secretary Deborah Lee James, who recently returned from a tour of the Caribbean and Latin America, said that additional training flights could help allies as they combat drug smuggling and other organized crime. For example, a USAF training mission with a Rockwell B-1 Lancer bomber in the Caribbean recently conducted a low-level pass to view an unidentified vessel. “Sure enough, it was drug smugglers,” James said during a Pentagon press briefing. The men and women of Joint Task Force-Bravo hosted James April 8 at Soto Cano Air Base, as she wrapped up her visit to various units in the U.S. Southern Command area of responsibility. James used her time during the visit to meet with Airmen of the 612th Air Base Squadron and other task force members to discuss the importance the base plays in the Central and South American regions. Upon arriving, James attended a discussion on the SOUTHCOM mission in Latin America and the Caribbean, covering topics including multinational firefighter training to build partner nation capacity, support to counterdrug operations, and humanitarian aid and disaster relief capabilities the base either supports or facilitates. James also took time to talk with Airmen assigned to JTF-Bravo to discuss force-wide issues she’s looking to address, including force size and structure, the new retirement system, the budget, and taking care of people. The primary focus of her visit centered on the Airmen, expressing her gratitude for their service as they explained how they support the SOUTHCOM mission at various work stations around the base. Secretary James was welcomed during a brief and cordial meeting with Chilean President Michelle Bachelet and other Chilean officials. “Seeing the work of our airmen and holding meetings with regional defense leaders showed the strong partnerships we have in the region,” Secretary James stated. Within FIDAE’s context, Secretary James participated in a series of official events with government, Military, and public officials. On March 30th, Secretary James, USAF Deputy Under Secretary for International Affairs Heidi Grant, and USAF Lieutenant General Mark C. Nowland, Commander of the 12th Air Force, met with Chilean Defense Minister José Antonio Gómez. They discussed numerous joint projects, the countries’ successful partnership, developments in technological research, the role of women in the Military, and Chile’s positive contributions in Colombia and Haiti. On March 30th, Secretary James met with the Commander in Chief of the FACh, General Jorge Robles, to analyze a current FACh helicopter fleet project and future contracting. Gen. Robles and Secretary James reaffirmed their interest in continuing their partnership as a way of bringing security to the Pacific region. 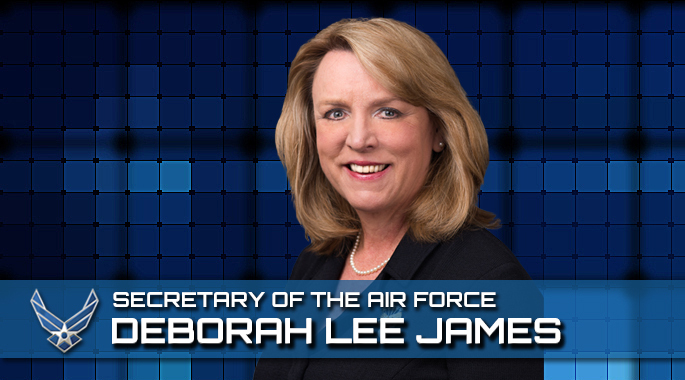 Secretary James is in charge of the USAF’s annual budget as well as the training and equipping about 664,000 active duty, Guard, Reserve and civilian Airmen and their families. In addition to her official schedule, Secretary James also conducted public outreach activities during her visit. She participated in the FIDAE Conference panel titled “Women in defense, aviation, and technology,” which was organized by U.S. aerospace company Boeing and featured representatives from the Chilean Air Force, Embraer, and LAN Airlines. Secretary James encouraged women to strive to achieve their career goals, stressing the need for progress on the issue of gender equality throughout the world. She also met with high school students from several schools in Santiago to discuss her professional experience as a woman in the fields of engineering and aviation. During her visit to Argentina from April 1st-4th, Secretary James visited the “Condor” building, headquarters of the Argentine Air Force (FAA), where she met with the FAA Chief of Staff, Major General Enrique Víctor Amrein, to discuss issues of bilateral cooperation. The Secretary General of the FAA, Major General José Videla, and the FAA’s director of legal affairs, Major General Armando Bonadeo, welcomed Secretary James, according to the FAA’s Noticias en Vuelo website. “The secretary was greeted with a red carpet and an honor cord. From the top of the steps, she greeted the formation present in the Central Hall in Spanish,” the website reported. ” It was great to visit shortly after President Obama and be able to help plan what our partnership with their Air Force will look like in the future,” she said after meeting with Argentine leaders on April 4th at the U.S. Embassy in Buenos Aires to discuss the way ahead in the renewed relations between both countries. From April 4th-5th, Secretary James visited Paraguay to promote ongoing collaboration and cooperation in defense matters between the partners. Secretary James and the U.S. Ambassador to Paraguay, Leslie A. Bassett, met with Paraguayan Minister of National Defense Diogenes Martínez. Secretary James also visited the First Air Brigade and toured the new facilities of the Integrated Air Surveillance Center of Paraguay. During her visit to Uruguay on April 6th, Secretary James met at the premises of the Air Brigade (Carrasco) with Uruguayan Deputy Secretary of Defense Jorge Menendez and the Chief of the Uruguayan Air Force (FAU), Air Force General Alberto Zanelli, and officials from the Ministry of Defense and the FAU. Secretary James toured the premises of the headquarters of Transport and Search and Rescue Helicopter Squadrons. She also toured the Remote Sensing Aerospace Service where she was briefed on the functionality of such equipment and the characteristics of the operations carried out by those units. Soon after, Secretary James flew to Brasilia and met with officials to discuss the long standing U.S-Brazil partnership, and then traveled to Colombia to attend high level meetings with Colombian Military officials. There, she established new cooperation agreements in terms of education and training. During this part of her tour, Secretary James visited the Air Command Military Transport (Catam), accompanied by Lt. Gen. Mark C. Nowland, and Heidi Grant, Second Executive Secretary of the USAF. They met with the staff of the Colombian Air Force, which was presided by the chief of the Colombian Air Force (FAC), Lieutenant General Carlos Eduardo Bueno Vargas . Secretary James acknowledged the efforts and professionalism of the members of the FAC, who in her opinion have excelled in different international exercises where they have participated. She praised them for their performance in the 2015 exercise “Ángel de los Andes.” The regional leadership of the men and women of the FAC was evident in that and other operations. Secretary James also expressed interest in establishing a plan for the exchange of Military personnel of the FAC and the USAF for different types of training in areas aimed at combating drug trafficking, technology, and Military capabilities to strengthen both institutions. On April 8th, Secretary James arrived in Honduras to visit the men and women of Joint Task Force-Bravo, a SOUTHCOM component , at Soto Cano Air Base, as she wrapped up her visit to various units in the region. James used her time during the visit to meet with Airmen of the 612th Air Base Squadron and other members of JTF-Bravo to discuss the importance the base plays in the Central and South American regions. Overall, the primary focus of James’s visit centered on the Airmen, and she expressed her gratitude for their service as they explained how they support the SOUTHCOM mission at various work stations around the base.